The following statement goes out to not only Erich of ‘Ancient Astronauts’ fame…but to David Hatcher Childress, Michael Cremo, Giorgio A. Tsoukalos, George Noory, all the evolutionists and believers in Von Daniken’s theory of alien contact long ago. Recently aired on the History Channel was a 2-hour, 2009, documentary called ‘Ancient Aliens.’ The menu blurb read: ‘Whether aliens influenced mankind in ancient times.’ Erich, who did not look his age, was interviewed along with the lineup mentioned above. This writer (Yurchey), which once strongly embraced the idea that aliens account for the fantastic enigmas and grand achievements in prehistory, realized that the true answer was even more incredible. The mistake made by proponents of the ‘Ancient Astronaut’ hypothesis is they diminish the phenomenal stonework created by the human race with advanced equipment. A. A. theorists denigrate what our ancestors achieved by unbelievable, technical means. Von Daniken must maintain early humankind was primitive and that archeology books are ‘right on the money’ for his viewpoint to ring true. If we were primitive during the so-called ‘Stone Age,’ then the construction of pyramids; cutting and transporting huge monoliths would be impossible. We would need ‘help’ and ‘assistance.’ Since so many pyramids and alignments of great megaliths indicate/incorporate vast astronomical knowledge, then it is sensible that we have been visited in the past by extraterrestrials. Certainly, we have been visited in the past by aliens. The question is, ‘Where do you place the state of prehistoric humans?’ Did we need help and assistance? The answer is, ‘Not if WE, us, humans were super-advanced during the Stone Age or the time of pyramid building.’ Aliens are not necessary to explain the extraordinary wonders of the past if people lived in high-tech societies and traditional history erred. Our ancestors lived and thrived in high-tech societies during numerous ages, over long epochs of time. We can clearly trace (in stone ruins to earthen mounds) their passing as devolution and retrograde technology. But once, in the beginning of humankind, was magnificent Atlantis. The missing element in Von Daniken’s philosophy is Atlantis. 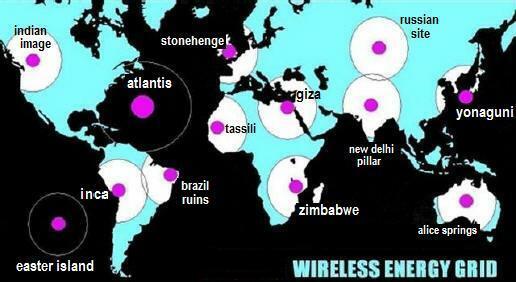 Atlantis is the source of the early and seemingly otherworldly, advanced technology. Atlantean knowledge, passed down to the Pre-Egyptians and Pre-Incas, accounts for the pyramid building and transport of super megaliths. Atlantis, an ultra-human colony, explains many similarities between first cultures across the ocean. It was not aliens, Erich…it was our ancestors. [This writer can speak with confidence as I announce the completion of the manuscript ‘We Are Fallen Gods’ - ‘How the work of Nikola Tesla destroys Darwin Evolution and changes the Human Race into gods.’ The conclusions are the result of 35 years studying Atlantis and Tesla. Read this writer’s ‘Atlantis Power Grid’ article to discover a connection between Stonehenge, Easter Island , the Great Pyramid, etc; that form a World Grid in prehistoric times. The world construction was created by HUMANS as each grid-point became a Cradle of Civilization]. In the documentary, Von Daniken presented an onslaught of evidence showing what could only be the work of supermen and superwomen from some distant past. But, each time the stonework at Tiahuanaco; Teotihuacan ; Puma Punku; Peri Reis maps or the Bagdad Battery was mentioned…he said it was the result of ‘EXTRATERRESTRIALS.’ How does the Bagdad battery or the Antikythera Machine prove extraterrestrials? The mistake is to assume our ancestors incapable of such technical wonders. EVD is to be credited for his research, findings and 45 years (like a relentless juggernaut) of pushing the alien agenda. But, Von Daniken is wrong in the respect that every shred of ancient miracle is really a true testament of the high state of humans in prehistoric times. When Erich points to aliens as the answer, he should be pointing to the greatness of early HUMANS. Darwin Evolution is 200 years old and has already been shown to be an obsolete concept. The above list of researchers and writers as well as many others believe our ancestors were primitives. (This writer told George Noory on ‘Coast to Coast’ that our ancestors, on their own, had high-tech. He did not buy it and soon yanked me off the radio show). Ancient Astronaut theorists point to items like the amazing carving at Palenque as evidence of the ‘alien’ theory. Erich will demonstrate stone reliefs of Egyptians carrying what could only be light bulbs. Wait a minute; these were HUMANS; the Mayan and Egyptian figures are our early ancestors. They were people, not aliens. The Indians did not fly back to their alien planet; they degenerated into the next/lesser stage of human over much time. Where are the depictions of 3-headed, 5-eyed creatures that are (you know) ALIEN? The colossal constructions of pyramids and knowledge within them could easily have been manufactured by literal supermen and superwomen, our ancestors. On prehistoric cave walls, on numerous continents, are paintings of ‘round-heads.’ The humanoid figures also seem to employ modern equipment. EVD suggested these are ‘extraterrestrials’ in spacesuits when they could also be humans in radiation suits testing a devastated, nuked area. The key is to take everything Von Daniken reports and apply it to the prehistoric HUMANS. It is proof, not of aliens, but of the greatness of our human heritage; evidence of a long, lost, technical paradise on Earth; an Atlantean utopia; an Eden and what humans can achieve at their best! (Biblical angels were human). The documentary assumed the truth was either Von Daniken’s viewpoint or on the side of the skeptics and debunkers. The answer, to account for fantastic anomalies (EVD material), was either ALIENS or ‘no aliens.’ Either Erich was correct or his skeptical critics. Those two alternatives cannot be the only candidates. We must allow for the possibility of HUMAN HIGH-TECH in the distant past; a New Genesis where humans needed no aid from the heavens to do what they did. The oddity is EVD knows of the large-brained Cro-Magnons. He has shown us the ‘impossible’ brain operations (holes) in skulls discovered at Cuzco . These were Cro-Magnon, our large-brained ancestors. Yet, Mr. Von Daniken fails to make the connection. The skulls were humans and not aliens. We should not run to the ‘alien’ explanation when the evidence suggests a grander form of human. Archeologists have a large problem on their hands. How can they explain the Von Daniken material? How do traditionalists or conservative archeologists account for the massive, transported, stone blocks as well as the extraordinary (astronomical and geophysical) knowledge within the constructions of our ancestors? First, they inform us that the stonework is not so extraordinary; the buildings were basically temples, observatories, tombs and idols to deities. Second, they educate us that the anomalies of the past are not that old. Historians and those of traditional sciences teach us that Mayas lived a few hundred years ago; Incas were a few hundred years earlier; Cahokia is 200 years old and the Great Pyramid is a tomb built a few thousand years ago. The ruins are so extraordinary that even placing their origin dates at hundreds of years old, rather than thousands, also does not work and makes no sense. None of the accepted dates are true for those civilizations. Nothing can be dated for certain. Even interpretations of Indian (carved) number systems should also be questioned. ‘Dating’ is done by references from previous books or first seeing the current landscape of ‘what is accepted by science.’ Then, dates are given. Dates are not arrived at by a ‘tried and true’ method of accurately dating something. They are ‘guesses’ based upon earlier and even more misguided guesses. The Great Pyramid, Tiahuanaco , Puma Punku, Pre-Incan/Andean fortresses have been referred to and described by the ‘impossible’ adjective. They are only impossible because of misinterpretations by our traditional educators. By conservative, conventional standards of only having primitive techniques…the major pyramids and other fantastic structures should absolutely not exist. The physics required, the technology required, the knowledge and ability to execute on such a grand scale, was not supposed to exist AT THAT TIME! The fact is the mega-abilities of our ancestors do not exist at the present time! We will only be able to build on that incredible scale in the very far future. The super constructions or existence of advanced knowledge in the past is a true paradox. But it is only a paradox if you are a part of the majority; believe in a form of Darwinism and see our ancestors as primitives. If readers are inclined to accept the usual status quo without question, then they have to greatly diminish our TIME OF GODS (Atlantis) and also remain blind to the exceptional age of prehistoric ruins. Traditionalists cannot fit into their brains or philosophy that an extremely ancient item can be super advanced. ‘They’ think sophisticated technology did not exist way back in the Stone Age. They are wrong. It makes more sense putting a mystery many thousands of years old than hundreds. Truth is…super-technology existed on Earth a long, long time ago. Maybe our entire view of the past through the eyes of mainstreamers needs a complete overhaul? Instead of labeling an anachronistic puzzle as something simple as ‘tombs’ or ‘temples,’ we should attempt to see its modernism. Rather that saying, ‘Oh, that’s nothing, primitive people were remarkable back then,’ we should really understand that they were far better and far greater than us at the present time. We were once gods and have lost the high-tech. He would enjoy your comments. Ask how you can get a signed disk of the 300-page ms.
Views expressed here are not necessarily endorsed by the hosting organization (World-Mysteries.com), our ISP or any sponsoring individuals or organizations. Reference to any specific commercial product, process, or services by trade name, trademark, manufacturer, or otherwise, does not necessarily constitute or imply its endorsement, recommendation, or favoring by the World-Mysteries.com. Links outside of the World-Mysteries.com web site (external links) are provided for user convenience and do not necessarily constitute or imply endorsement, recommendation, or favoring by the World-Mysteries.com. Please be aware that the disclaimer appearing on this page does not apply to these linked sites. We encourage you to read the posted disclaimer, privacy and security notices whenever interacting with any Web site. 1. Please note that articles that are posted on our website are not necessarily endorsed nor supported by us. 2. All articles on our site are copyrighted material by the authors to include any graphics that are included with them. 3. Photographs are copyrighted as well. Hotlinking a photo from our site must be granted permission by the Editor. This is due primarily to unneeded bandwidth usage that may have the potential of denying user access. 5. Although an article submission is fine, however, if said article is questionable it will be reviewed by the Editor prior to acceptance or rejection. 6. Guest material that is posted on our site may be removed at Editor's discretion and without notice; The Editor maintains the sole discretion if a guest article or material is to be removed. Requests for material to be removed by the individual who owns said material will be granted. 7. We will not be held liable nor accountable for ANY damages that may be incurred by anyone who visits our site. If you, the visitor, have any grievances with any guest material that is posted on this site, you are responsible for contacting the author in question. 8. This disclaimer is subject to change without notice, it is your responsibility to check here for any changes. * Failure to do so will result in your ISP and web host being notified as this can be construed as theft and copyright infringement. George Noory, the evolutionists, Von Daniken’s theory of alien contact long ago.